Yesterday was one of those days that was amazing..... We have the BEST customers ! Friends really.... I was BLESSED by a beautiful floral and a sweet note...anonymously. And that's not all...we also received a yummy blueberry cake...warm from the oven ! I can not THANK YOU enough...You know who you are. May your day be as BLESSED as ours was. April is bringing in so much new eye candy... The Gals are out finding the most WONDERFUL things. This time of year I just want to change things up ! We have had beautiful weather...so nice I can have the doors open... What a WONDERFUL SPRING ! 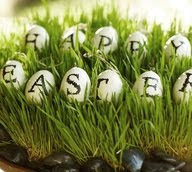 Wishing you all a JOY FILLED EASTER ! He is RISEN...that said it ALL !